I started the Chinese Tuesday night. Well, truth be told I had based and under-coated already so I took the opportunity to wash them all in black ink. I will start on the carrier first. I am looking to use a grey that is somewhat lighter than the grey the Indians were painted in. It will almost be white but at the same time I want it to appear as a grey. Very, very light grey. The black ink wash is good because it naturally darkens some areas at the same time as bringing the detail out. Painting session Thursday night I hope – the target is to get the carrier finished. Who’s ships are you using for this, GHQ, CinC, Shapeways? Navwar have an arcane ordering system however – see https://thomo.coldie.net/wargaming/update-1-on-pre-electronic-wargame-figure-ordering-a-piece-of-history and https://thomo.coldie.net/wargaming/update-2-on-pre-electronic-wargame-figure-ordering-a-piece-of-history for how I ordered these vessels. Just looking at the ships when I blow the picture up, the escorts on the left are showing some pretty serious mould lines. Probably not noticeable in this scale, but the ink-wash does show them up. My Seewulf 1/2400 choppers turned up today – they are tiny!!! 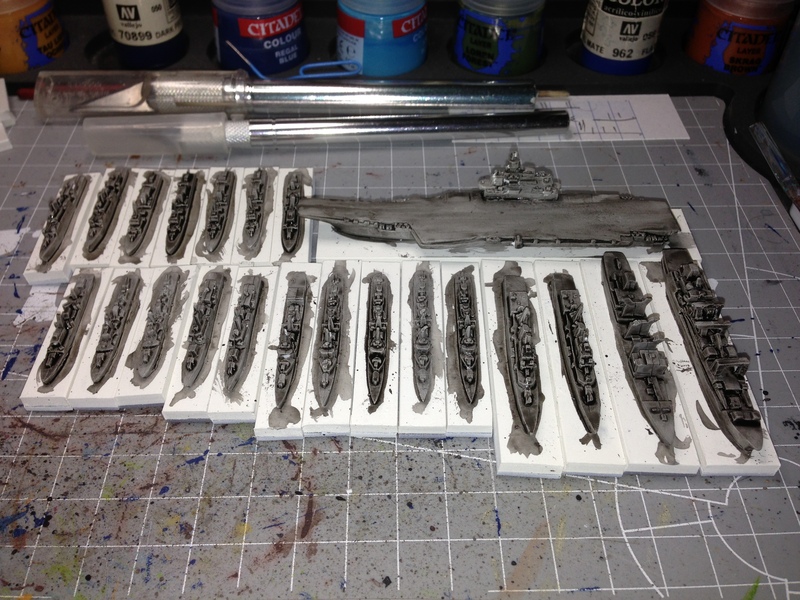 Just about to glue some of them onto the deck of the Brit Carriers. I started the Liaoning Tuesday night and hoped to finish it last night night but didn’t quite get it done. Have birthday dinner with local friends tonight for Madam (Brazilian BBQ seemed appropriate) and then a 40th birthday pub golf day tomorrow so I won’t get the Liaoning finished until Sunday. Still, it is looking good and I have high hopes for the PLAN as a fleet.